Total debt (public + private) in America is currently at a staggering $67 trillion. That number has been rising fast over the past 47 years, following the US dollar's transformation into a fully-fiat currency in August of 1971. Perhaps this wouldn't be such a big concern were America's income, measured by GDP, growing at a similar rate. But it's not. In 1971, the US debt-to-GDP ratio was 1.48x. That's roughly the same multiple it had averaged over the prior century. But today? That ratio has spiked to to 3.47x, more than doubling over just 4 decades. There are many troubling conclusions to draw from this, but here's a simple way to look at it: It's taking more and more debt to eke out a unit of GDP growth. Put in other words: the US economic engine is seizing up, requiring increasingly more effort to function. 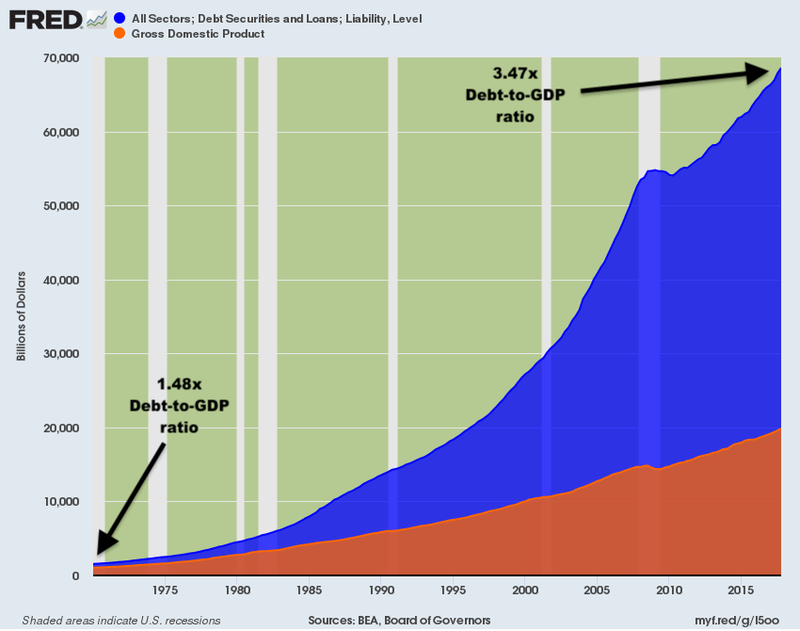 At some point -- quite possibly some point soon -- the economy will no longer be able to grow because all of its output must be used to service the ballooning debt load rather than future investment. Accelerating this point of reckoning are two major recent trends: rising interest rates and the end of global QE. Interest rates have been on a steady decline since the 1980s, making debt increasingly cheaper to issue and to service. 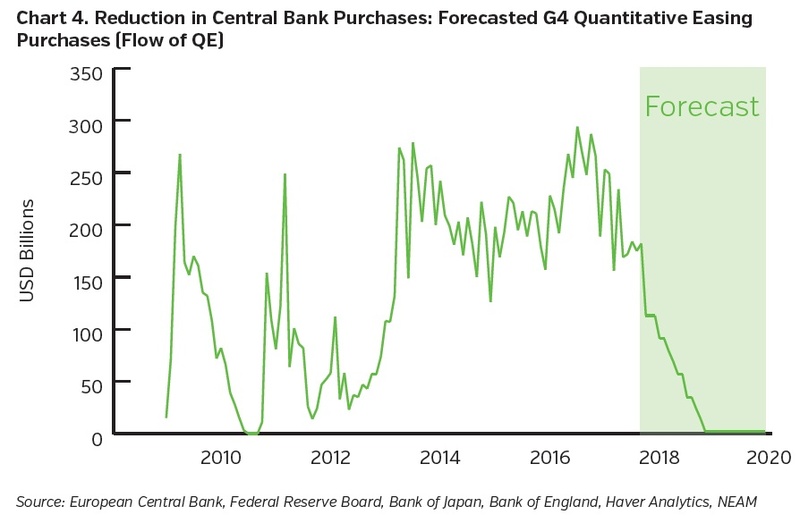 Since 2008, central banks have been voracious buyers of debt. Countries/companies have been able to borrow $trillions, enabled (both directly and indirectly) by these "buyers of last resort". But both of those trends are ending, fast. Interest rates have been rising off of their all-time rock-bottom lows over the past two years. While still low by historic standards, the rise is certainly material enough already to make the US' $70 trillion in total debt more expensive to service, putting an even greater weight on America's already-burdened economy. These higher rates make the US debt overhang even more expensive to service, while also forcing valuations downwards for major asset classes like bonds, housing and equities (the prices of which are derived in part by interest rates, as explained here). Without these indiscriminate buyers-of-last-resort, debt issuers will need to offer higher rates to entice the next marginal buyer. 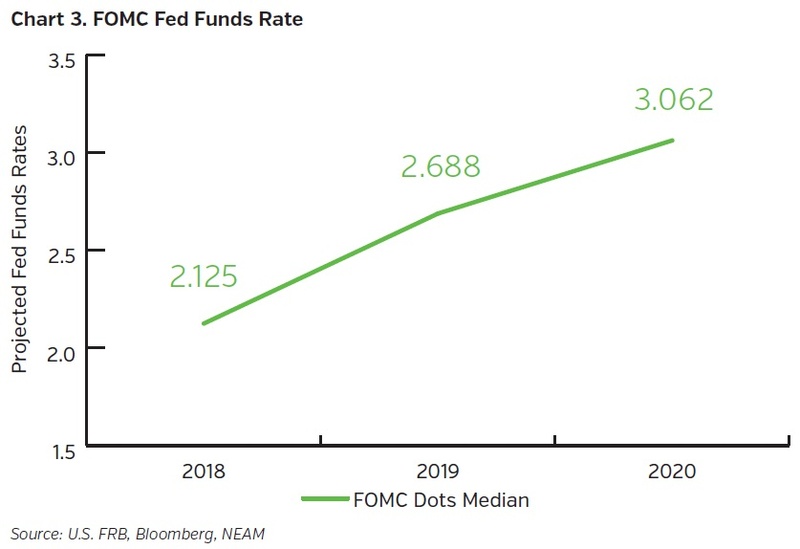 How much higher will rates need to rise as a result? It's pretty easy to make the argument for "a lot". If you're wondering what warning signs to watch for closely, or what steps to take in advance of the market convulsion predicted by Kunstler and Stockman, we'll be diving deeply into those at next week's Peak Prosperity New York City Summit on Sunday, Sep 16, 2018. You'll have the chance to meet these experts personally, spend the day with them, and ask them your most burning questions. To learn more about this event, click here. Bull market liftoff? Or bear rally rollover? It seems axiomatic that exponential growth in debt/credit (i.e. pulling growth from the future) is the means being used by the-powers-that-be to counter the law of Diminishing Marginal Utility (also known as Diminishing Returns). 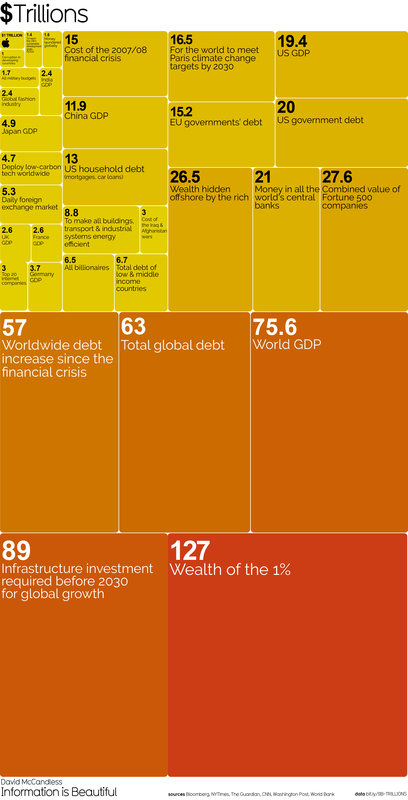 It also seems obvious that on a finite planet where perpetual growth is impossible, there are probably only two means by which this debt will ever be reconciled: abrogation of the debt (i.e. bankruptcy) or (hyper)inflation. Either of these 'solutions' will wreak havoc on the majority of (all?) people. Should archaeologist Joseph Tainter's thesis laid out in The Collapse of Complex Societies hold true, then 'collapse' is most assuredly guaranteed. And it seems that the financialised economic system may be the penultimate sand grain that impacts those other grains also near a critical state and leads to the eventual phase transition that concludes in a much simpler state (i.e. a loss of complexity). It seems to me that the only question that remains is will this transition be relatively lengthy such as that which occurred when the Roman Empire 'fell', or will it be relatively quick as it was for the Eastern Islanders? And the most significant issue, it would seem to me, is what the world will be like when we lose the energy sources required to maintain our globalised, just-in-time, industrial civilisation (especially water and food production and distribution). Just looking at my own region (province of Ontario, Canada), we long ago overshot our natural carrying capacity and are dependent upon food imports to feed at least 25% (and growing) of our population. Only 3-5% of our current food production is consumed 'locally', while most of it (at least 70%) is channeled towards ethanol (soybean and corn). This hardly seems wise and certainly not sustainable as more and more or our limited arable lands are paved over to accommodate a continually growing population (thanks to immigration since 'domestic' growth is below replacement values). The breakdown of trade (whether it is due to trade wars or other factors such as finite liquid fuels) appears to be increasing (not surprising given we are all struggling to maintain or increase our slice of the pie), meaning food will become not only more costly but increasingly sparse. But try telling/informing the political class who are intent on chasing growth (mostly because there is money to be had and they hold the belief that growth only has positive consequences and any negative ones are easily 'solved'--at least, that is the narrative they sell) that we are bumping up against real, biophysical limits and that their pursuit of endless growth is actually the antithesis of long-term 'prosperity'. It is next to impossible. We seem destined to experience the collapse that accompanies such overshoot, regardless of our protestations and attempts to alter our trajectory. I am increasingly convinced most of us will suffer significantly as the-powers-that-be ignore the warnings and signals that abound and this all plays out. 30% of traders are so young they have NEVER experienced anything other than zero interest rates. 66% of traders have no adult memory of the dot-com crash of 2000. Only 43% of traders are old enough to remember the 2000 dot-com crash and the 2007 credit crisis — the two most significant economic cycles of the last 15 years. What could go possibly go wrong? Though I agree with most of what David Stockman is saying these days it's hard to get past the fact that he enabled the worst of the deficit problems we now face. When he was Reagan's OMB Director he had no problem signing off on budgets which included massive theoretical spending cuts which were never turned into reality. Year after year he did the same thing, always kicking the spending cut can down the road. Reaganomics became the religion that deficits don't matter. Succeeding adminstrations and congresses followed his example. You can blame the Fed for printing money but they did it in large part to cover the continual deficit. In his book, Stockman appears quite proud of the stunts he pulled to hide the lack of budget cuts. I've never agreed with the call for governments to balance their budgets. As I've always said, it is irresponsible for any government to attempt to balance its budget. It is impossible for national governments to have balance budgets in a debt based montary system because it depends on ever increasing debt to continue to exist. To do so would cause the collapse of the monetary system and the starvation of a large portion of the population; unfortunately the most vulnerable portion who has the least culpability in creating the problem. It would not, as many people suggest, create some "short term pain but long term gain" as the economy restructures itself with a more efficient allocation of capital and resources that doesn't rely on government debt and handouts; it would simply cause the deaths of millions of innocent people. That philosophy is not consistent with how the mechanics of the US economy have changed over the decades since the 1930's. Don't get me wrong; I'm in no way supporting the direction the US government has taken since the Reagen years and its ballooning deficits. I just don't think that at the time they knew what else to do because they knew that doing something as drastic as slashing government spending would have caused a historic deflationary crash and the unravelling of society. As the US economy became hollowed out over the decades by offshoring of manufacturing and automation displacing the remaining jobs, so too did real inflation-adjusted government tax revenue; one of the significant drivers of ballooning governemnt deficits. True, a lot of that government spending was on the military but it could be argued that this was required to keep the system from deflating; and certainly to maintain the US dollar as the international reserve currency for so long. The other way they could have addressed ballooning government deficits would have been to tax the rich so that the 99% would have more assets to support themselves with, and bring in a new non-debt based currency that didn't rely on growth. But the government now answers to the rich and the bankers so both of those options have always been off the table. Taxing that bottom right corner would go a long way to help augment government books in the upper right box, second from top. Could you fix your graph? In each box, put a shading ///// cross hatch that represents the amount of each box that gets paid out in taxes over five years. Maybe that's in the bottom of the box. Do that I black. Then in each box,same thing in white, the amount of benefits and income recieved from the government in five years. Do that on the left, with a different direction crosshatch, \\\\\. Please don't forget property protection as a benefit, and especially intellectual property protection. it is irresponsible for any government to attempt to balance its budget. It is impossible for national governments to have balance budgets in a debt based montary system because it depends on ever increasing debt to continue to exist. If that's true, how did the US manage in the 135 years leading up to World War I? We ran up debts with various wars which we gradually paid off. The graph below is as a % of GDP but we clearly paid off the debt in 1830 and 1855. We probably would have in the early 1900's if not for the creation of the Fed. Though debt based money systems require increasing debt it can be owed by individuals and corporations instead of the government.